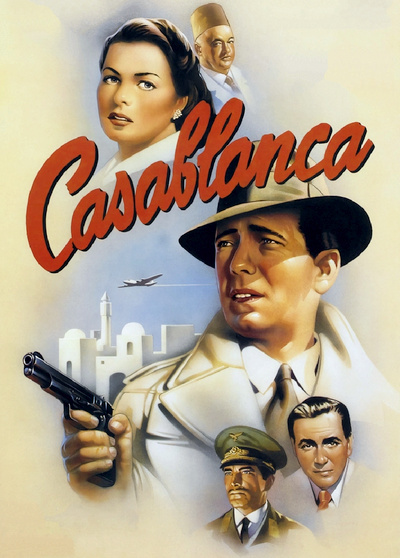 The story involves Rick (Bogart), an American who owns a bar in Casablanca on the eve of the German’s invasion of North Africa. Many refugees from the war in Europe come through the city and one of them turns out to be Ilsa (Bergman), a former love of Rick’s. The two had a whirlwind romance in Paris before the Nazis invaded. She was married, but her husband was missing and presumed dead. Just as she and Rick were getting ready to leave Paris together, she abandoned Rick with no explanation to him. Unfortunately for Rick, her husband – Victor Laszlo (Paul Heinreid) – is very much alive and shows up in Casablanca with Ilsa. In fact, he is fleeing the Nazis and needs Rick’s help to secure some papers that will allow him to travel to safety. Once they see each other again, Rick’s and Ilsa’s old feelings come back. Will Rick help Ilsa and her husband escape, or will he try to win Ilsa back for himself? And does Ilsa even want to go with Victor or stay with Rick?